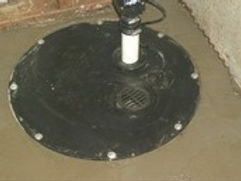 In general, if there’s a significant moisture problem in your Crawl-Space or Basement, you do need a Sump Pump. Modern sump pumps are extremely reliable and the ones we install are rated to work without problems for many, many years. The standard cast-iron 1/3hp Zoeller pump we install is commercial-grade and can be paired with an additional battery backup pump to add that additional level of security and peace-of-mind. All crawl spaces in your home could definitely use a Crawl Space Vapor Barrier, but if it’s already wet down there, we need to get that area dry on an ongoing basis before a Vapor Barrier will do you any good. The best way we know how to remove water from Crawl Spaces or Basements is by using a drainpipe and/or some kind of Basement Perimeter Drain, which evacuates the water. Unless you live on a hillside and/or your basement is above ground, getting the water out of your home will require a Sump Pump! Everyone has heard of sump pumps failing, but what we bet you haven’t experienced is commercial-grade sump-pumps failing! Why put a prone-to-failure ‘home-grade’ sump pump in your house especially when so much is relying on it? 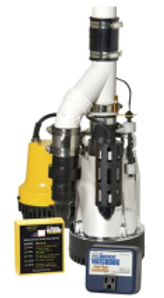 We use the BEST SUMP PUMPS AVAILABLE. The Right Sump Pump for the Job! We use Zoeller cast iron pumps 1/3 horsepower because we have found them to be the most reliable on the market. We have literally never had to replace a Zoeller pump yet. Whenever we install a sump pump and liner, we always provide the option of a battery backup system. What this comprises is a new separate battery-operated pump, a deep-cycle marine battery, and a charging unit. Now, why use another pump? Can’t you just install a battery for the current (wired) pump? By installing an extra pump, you have true redundancy! Extremely Heavy Rainfall: If the incoming water is somehow filling the sump liner faster than the regular pump can handle, now you have a second pump! BOTH PUMPS CAN RUN SIMULTANEOUSLY! The main reason for removing water from your crawl space or basement is to avoid mold and the structural damage it can create, but if your sump liner doesn’t have an air-tight lid, moisture will still be getting out. Similarly, if your basement or crawl-space floods from a different source, for example, a busted pipe from your own house, the water will flood on top of the Vapor Barrier. Your air-tight sump lid comes equipped with a built-in drain, so No Problem! Any water running to the sump will drain in without harmful moisture leaking out! If your sump pump is just laying in a dirt hole, the dirt will begin to cave-in and jam the pump and your crawl space or basement will start flooding again. 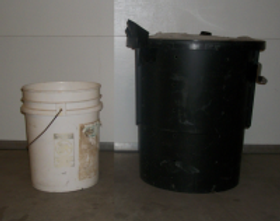 We install a non-corroding ‘barrel’ flush with the ground or cement flooring surrounded with 2-3″ of drain-rock gravel, and then put the sump pump inside. Our Sump Liners have bolted-on lids and can have multiple ‘inlets’ installed, allowing multiple sources of water to be pumped out of your crawl-space or basement. You have more time before the sump liner overflows just in case the power goes out (this is why we recommend a Battery Backup System– see above). There’s enough room to install a Battery Backup System, or even tertiary (wired) sump pump, without ‘filling-up all the space’ and causing the sump pump(s) to cycle on/off rapidly.